This is my go to recipe when we grill. These burgers are juicy and have just the right amount of heat to make me happy. We grill all year round in New Orleans, but you can make these on the stovetop if you aren't able to grill like we do. Combine the hamburger ingredients in a large bowl. Mix by hand, but don’t over work the meat. If you are grilling, place the patties on a cookie sheet and place them in the freezer until you are ready to place them on the grill, so they firm up. 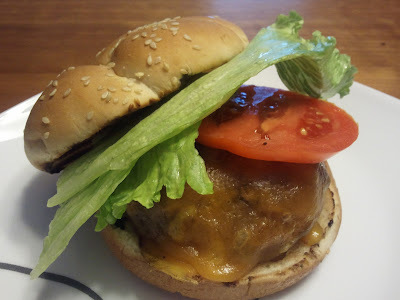 If you are cooking inside, place the hamburgers in a skillet over medium heat. Cook for 4 minutes per side or until the outside has a dark brown color. Serve hot on buns with cheese, lettuce tomatoes, and condiments. These freeze great. I usually double the recipe and place the leftover patties in the freezer for another meal. I buy the hot sausage that is made fresh at the grocery, but you can also use Johnsonville Hot Italian Sausage if you can't find the fresh made kind. I like to serve these with the Balsamic Onions. Follow my link to find out how I make mine.